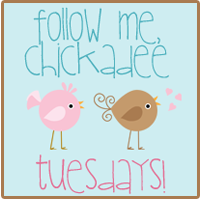 I'm the featured blog today at Follow Me Chickadee over at The Life of a Sippy Cup Mom. I'm not a mommy, but I still love this blog. And you should too. So go check it out and link up and meet some great new bloggers! PS. In like fifth grade we hatched chicks in our classroom and I named mine Chick-a-dee-dee-dee-dee-dee. Yeah, with that many dees. It took awhile to spit out. In my fifth grade mind I was being super creative and cool. Totally unrelated, but that's what I think of when I see this linky party. Heh! Yay for being featured! I'm not a mommy either and still love the blog! Your blog is too cute! Love it! I'm a new follower from Follow Me Chickadee. I'd love for you to visit my blog and follow back.